Winter has finally come to Florida. In Central Florida, we’ve had nights in the 30’s with wind chill down to the 20’s. For many people this means staying inside in an attempt to stay warm, but my husband and I are both very happy to start bonfires and cozy up next to them with the hot beverage of our choice. For my husband, it’s always coffee, though I’ve never been a big fan myself. Hot tea is good, but I’m picky about my teas (I’m a tea snob…what can I say?). So my hot beverage of choice has almost always been hot chocolate. However, I have been slowly switching over to something else (and dragging my husband with me). The beverage I’ve been consuming can be served warm or cold (though I prefer it warm) and has amazing medicinal benefits. 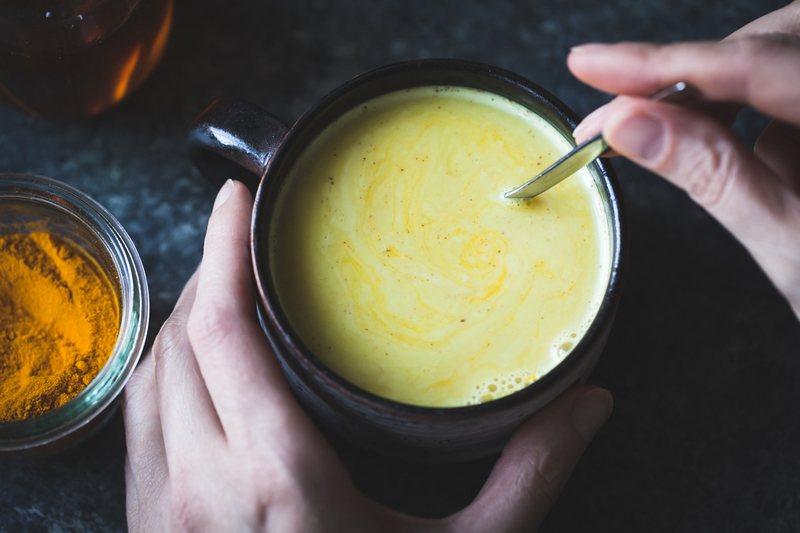 Golden milk is not necessarily a “milk” at all. The traditional recipes call for coconut milk, coconut oil, honey, and turmeric. I like to spice mine up a little, with ginger and black pepper. Other people like to add a touch of cinnamon and cayenne, or use maple instead of honey to sweeten it. You can also choose to make it with regular milk, or any non-dairy milk of your choice. I tend to jump between using coconut milk, cashew milk, or regular milk. The basic recipes start off with adding a paste to your “milk” and cooking them together, so I’m including a basic turmeric past recipe, I usually just make it all at once without making the paste. Keep in mind that turmeric can be very bitter if not cooked long enough. Don’t be afraid to cook it a little extra if you feel you need to. Turmeric is a close relative of ginger and has many of the same medicinal properties. However, the most notable thing about turmeric is called curcumin. Curcumin is most notorious for its anti-cancer properties. It has been proven to actually prevent blood flow to tumors. Without the blood flow, the tumors can’t grow. Curcumin actually helps to modify the genetic code in cancer cells and destroy them, as well as helping to prevent healthy cells from mutating into cancer. Coconut Milk contains lauric acid which is not commonly found in nature. Lauric acid is used by your body to make monolaurin, which actually helps destroy certain, lipid-coated, viruses. Some lipid-coated viruses include HIV, herpes, influenza, and measles. So coconut milk actually helps your body fight off these diseases. Coconut Oil is necessary for these recipes because turmeric is fat-soluble. This means that the beneficial compounds in turmeric can only be used when certain fats are present. Coconut oil contains the healthy fats needed for our bodies to be able to use turmeric. Combine all ingredients, except the coconut oil, in a pot and cook, stirring, until they form a thick paste (about 7-10 minutes). Remove from heat and whisk in the coconut oil until fully incorporated. Refrigerate and hold up to 2 weeks. Combine all ingredients, stirring or whisking to combine. Heat until just under boiling. Once heated and combined, you can serve it hot or cold. Combine the coconut oil, turmeric, ginger, and black pepper in a pot on the stove. Cook them together, on low-medium heat, about 7-10 minutes. Add in the coconut milk and a little honey. Raise the heat to medium-high and simmer for about 5 minutes, stirring continuously. Remove from heat and cover. Let sit 10-15 minutes. If you need more honey, now is the time to taste and add it. Strain and serve, warm or cold. Combine the coconut oil, turmeric, and cayenne in a pot on the stove. Cook them together, on low-medium heat, about 7-10 minutes. Add in the coconut milk, cinnamon stick, and a little honey. Raise the heat to medium-high and simmer for about 5 minutes, stirring continuously. Remove from heat and cover. Let sit 10-15 minutes. If you need more honey, now is the time to taste and add it. Strain and serve, warm or cold. Like all of my recipes, these can be modified to suit your needs or taste buds. Some options, instead of using milk and honey, use bone broth and serve warm. This makes a savory beverage, or a great soup stock. Try adding Chai spices like cardamom and clove, along with both cinnamon and ginger, to make a Golden Chai Milk. Have fun! Experiment! And let me know what you think in the comments below!